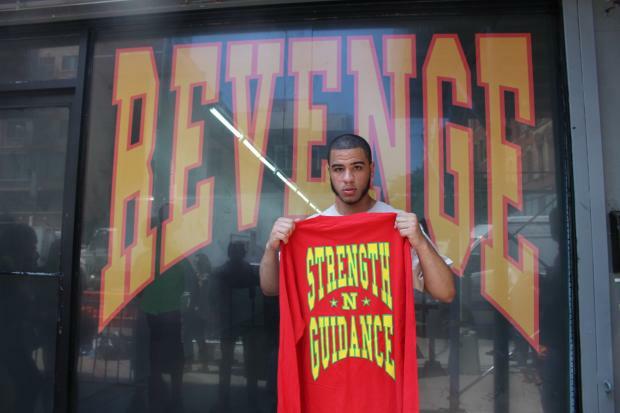 Drake super-fan Ivan Cruz waited in line for five hours to buy this shirt. Drake fans stood in line for hours in the blazing sun on Thursday to buy exclusive T-shirts and hoodies at a pop-up shop launched by the rapper at 208 Bowery — and they have no regrets. "Absolutely worth it," said Upper East Side resident Ivan Cruz, 19, who waited in line for nearly five hours to buy a bunch of the merchandise, advertising Drake's currently underway Summer Sixteen tour. Cruz said he showed up to claim his place in line at 9 a.m., got in the doors at 1:45 p.m., and emerged shortly after 2 p.m. with bags of T-shirts, hoodies, pants, and hats emblazoned with lyrics from songs on Drake's latest album, "Views." The shop's bouncers were letting in two or three fans at a time, he said. The four-day pop-up shop, which will be at the storefront Aug. 4 - 7, is running in conjunction with the Canadian artist's spate of concerts at Madison Square Garden. The rapper is performing each night at the venue Thursday through Saturday, plus one performance on Monday. Cruz said he would not be attending the concert because the tickets were too expensive. Remaining tickets to the shows run at around $180, according to Ticketmaster. T-shirts at the pop-up went for around $40, while hoodies went for $60. Some diehard fans waiting to browse the merchandise will also be lining up for the concert experience, however. New Jersey college student Abdul Ali said he made a special trek to the city Thursday to wait in line for the pop-up, and will be heading to Madison Square Garden directly afterwards. "I've never done this before," he admitted, of braving long lines for any event, but continued to say he felt it was a worthwhile cause. "I'm a huge fan — I really enjoy his music," he said. "I think he's super talented. He can act, he can rap, and he can sing too." Drizzy himself has been getting the word out, posting advertisements for the four-day shop on social media.